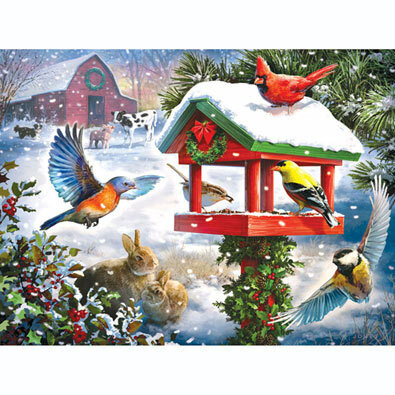 This 500-piece jigsaw puzzle is designed by Larry Jones and measures 18" x 24". Colorful birds flock to a snow-covered bird house on a winter night. This 500 piece jigsaw puzzle is designed by Larry Jones and measures 18" x 24". Available in two piece count. This 500-piece jigsaw puzzle is designed by Larry Jones and measures 18" x 24 There is a glow to this snow-covered bridge on a cool winter night. Available in two piece counts.